The histogram is another super important topic for photography, which you need to learn to bring your landscape shots to the next level. It might sound scary at first, but it's a very easy topic to grasp. We all have that smart friend that, no matter what, always says the right thing at the right time. Well, in the photography universe, the histogram is exactly that friend and it tells you if your exposure is correct or incorrect. So, you better get to know it well enough and always listen to it (although it doesn’t really speak to you). This topic is complimentary to the exposure triangle; therefore, if you haven’t heard of the exposure triangle before or you are not sure what it is, I suggest you to read this article first. The histogram is a luminosity-based representation of all the pixels of your image. Blacks and shadows are represented in the left-hand side of the graph, mid-tones in the middle and whites and highlights in the right-hand side. The histogram is the accurate representation of all the pixels of your picture distributed by luminosity values between 0 and 255, where 0 is 100% darkness and 255 is 100% brightness. Already confused?! Let’s make it very simple. The grey bar diagram below is the histogram and it works like a luminosity chart for all the pixels in your image, where the dark tones are represented in the left-hand side, the mid-tones in the middle and the bright tones in the right-hand side. This graph is divided in blacks in the far left, followed by shadows in the mid-left, then mid-tones in the centre, highlights in the mid-right and finally whites in the far right. Consequently, the darker areas of your photograph will be present in the left part of the histogram and the brighter areas in the right part. The height of the bars, instead, indicates the proportional number of pixels in a specific area of the histogram. Briefly, the histogram plots the number of pixels against their luminosity values. A lot of dark pixels means higher bars in the left side of the diagram and a lot of bright pixels means higher bars in the right side instead. For example, histogram A has an evenly distribution of pixels throughout the whole luminosity range and this tells you that the image you just captured is well-exposed with a balanced amount of shadows, mid-tones and highlights. This is sometimes referred to as the “perfect histogram”. This term sounds like a mythological creature from a galaxy far far away as it should sound, since you don’t shoot for the perfect histogram, but for the right exposure and according to your processing style (more on this in later on). Histogram B, instead, represents an overall dark image as the histogram “leans” towards the left-hand side of the graph, showing that most of the pixels of the photograph are in the darker areas (i.e. shadows and blacks). Finally, Histogram C is shifted towards the right-hand side of the graph (highlights and whites), illustrating an overall bright picture. You might have noticed that the grey histogram isn’t the only diagram in the pictures above; in fact, there are also colour histograms. The red, green and blue graphs (RGB) are indeed the main colour histograms for every image and the overlapping of these three diagrams forms the grey histogram we just talked about. You can also see yellow, cyan and magenta graphs, which instead are formed by the overlapping of just 2 of the three RGB diagrams. If the histogram touches the left and/or the right edge of the graph, it's called clipping and it will translate into loss of details in the dark and/or in the bright areas. 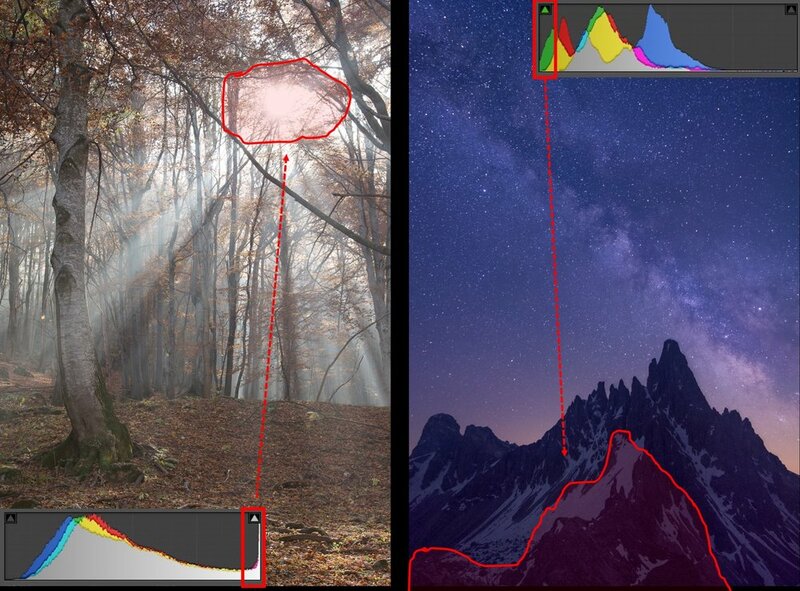 Now you know what the histogram is and that left is dark and right is bright, but what does it mean when the histogram touches the edges of the graph? When the pixels of your histogram are “squished” all the way to the edges is called clipping and it translates into loss of details in your photograph. If the diagram touches the left edge, it means that your shadows are clipped (shadows clipping); hence, some details in the darker areas are missing as they are 100% black. On the other hand, if the diagram touches the right edge, you have highlights clipping; therefore, some brighter areas are 100% white and, of course, without details as well. You can easily spot clipping in Lightroom as the tiny arrows above the histogram panel will turn grey if clipping is present and if you hover them Lightroom will show you what areas are clipped. If clipping is present only for one of the RGB channels, the arrows will turn either red, green or blue. Left: Highlights clipping is caused by the sun included in the frame. All those pixels in the red area are basically 100% white. Right: A bit of shadows clipping is present in this picture as the ambient light was very very low when I shot this Milky Way photo. As a result few pixels at the bottom of the frame are 100% black. When does clipping occur? The correct answer is: it depends on the scene. For example, if the sun is in your frame, highlights clipping will definitely occur as the sun is really bright and all those pixels will be a 100% white (as you can see from the picture on the left). Shadows clipping, instead, can occur at any time and in different situations, especially if you shoot at night or low light situations (picture on the right). Just remember that clipping usually means that your exposure is incorrect and most of the times it needs to be fixed. Highlights clipping typically means that your picture is over-exposed and shadows clipping means that it’s under-exposed. Though, there are certain situations where clipping is unavoidable. I guess you have already figured out that clipping is not a great thing for landscape photography and photography in general, since you are losing details in your pictures. You should always keep an eye open for the edges when checking the histogram to avoid clipping in your photograph if that’s possible. The histogram also tells you if your image is generally too dark or too bright and helps you make those final tweaks to obtain the perfect exposure for your scene. For this reason, it’s always useful to visualise your predicted histogram in live view mode or to activate it in the picture review mode, in order to see your histogram and to check if your picture is well-exposed. For example, my histogram is always present in the image review mode, so I know which settings I have to tweak for the perfect exposure (unfortunately I don’t have a fancy live view estimated histogram yet). Don’t just trust your sight or the back screen of your 2 trillion dollars camera when reviewing your images, the LCD screen is back-lit and can deceive you pretty easily (actually it’s always deceiving). The picture above from Saxon Switzerland is a straight out of the camera shot and, at first glance, it seems a well-exposed frame, but if you look at the histogram you can see that some shadows clipping is present. Hence, I lost details in the darker areas. How can I fix this? Well, the amount of clipping here in this example is minimal and can be fixed with some good old post-processing, but it definitely shows you that only trusting your back screen will deceive you. Therefore, to fix this case of shadows clipping, I need to use our beloved exposure triangle. According to the histogram, my first shot was a little under-exposed (or just a tad too dark); therefore, I needed to add a full stop or a fraction of a stop to adjust the exposure. In this case, I have increased the shutter speed (from 1/8s to 1/4s) to add 1 full stop to my previous EV. Doing this allowed me to achieve a well-exposed picture, as no shadows clipping was present in my second frame. In this other seascape example below, my first straight out of the camera shot seems absolutely fine, but again when you look at the histogram you can tell that some of the reds and yellows highlights are clipped. The histogram immediately tells me that my first attempt is a bit over-exposed and I have to tweak either my shutter speed, aperture or ISO to achieve the perfect EV. In this case, I have closed my aperture from f/11 to f/13 (-0.3 stops) to retain a shutter speed of 1/5 for the texture of the water. The second shot is definitely better as there's no highlights clipping and I kept shooting waves with this EV since I knew it was the right exposure for that light situation. This shows you that the histogram is an essential tool to use in order to achieve the perfect exposure for your frame. Reviewing the histogram is always the first thing I do after taking a shot, as this little graph tells me if my exposure is good or utter rubbish. If my picture has highlights clipping, I’d have to subtract some stops or a fraction of a stop from my previous over-exposed EV. In other words, I have to make my picture darker. If I have shadows clipping, I’d have to add some stops or a fraction of a stop in order to recover my darker areas from my previous under-exposed EV. Hence, I need to make my picture brighter. Pretty straight-forward right?! It's also useful to note that, if there's a very small amount of clipping (I mean a very teeny tiny one like the first example of this paragraph), this can be adjusted with some post-processing as all you loose is just few pixels in your frame. If you are not a pixel peeper, this won't be a problem. We just covered all the most important things about the histogram. Now, let’s further integrate them with the exposure triangle, since these are 2 inseparable buddies. Here's another practical example. When I approached this scene in Lago di Sorapis, I chose my composition, set up on a tripod and dialled in my first EV according to the live view exposure metering mode in my camera. My first EV was ISO100, f/8, 1/60s and gave me the histogram you see on the bottom, where all my pixels were evenly distributed along the luminosity axes and no clipping was present. That's great, right?! That was a correct exposure for the scene, but I wanted to close my aperture to get everything in sharp focus as the mountain was a tad soft. Therefore, I closed my aperture from f/8 to f/11 to have a deeper depth-of-field. If you have read about the exposure triangle, you might know that by doing so I have subtracted 1 full stop from my first EV. Thus, I needed to compensate this by adding the same amount of stops with the shutter speed or the ISO. Since I was on a tripod, I immediately slowed down my shutter speed from 1/60s to 1/30s (adding 1 full stop back) and fired another shot with my second EV (ISO100, f/11, 1/30s). You can see how the 2 histograms are basically identical even though I have changed my settings. By checking and understanding the histogram and my camera settings, I could replicate my first EV with a second EV straight away without hiccups. 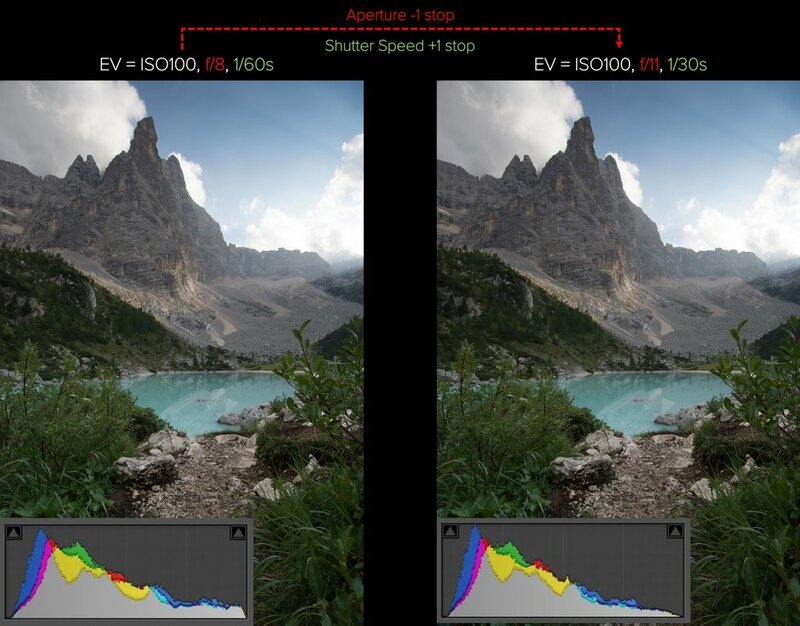 This can be really hard to do if you don’t read your histogram and only trust your LCD screen as it will transform in a frustrating guessing game very quickly and you might lose the best light. 1) live view metering mode isn’t always right unfortunately, even though it’s a good starting point for your first EV. 2) the histogram is really helpful to tweak your settings to achieve your perfectly well-exposed frame. In the very last example, you just saw how you can use the histogram to make sure you get a well-exposed image. The second EV of the river shot was definitely a good exposure as there was no highlights or shadows clipping and the pixels were almost spread evenly throughout the histogram (apart from the big spike on the left side). If I had already gotten a well-exposed picture, why did I changed that? In this case, I tweaked my settings again to get a good exposure for my processing style. My processing style is very dark and I like to gradually process my pictures with a lot of local mid-tones levels adjustments that usually darkens the initial RAW file quite a bit. For this reason, I always try to stay away as much as possible from those huge spikes on the left-hand side. Of course, this is not always possible ;) This is more an advanced tip on how to use the histogram to your advantage, but you should always try to pre-visualise what kind of shot you want to get out to every situation beforehand, so you can expose the image according to your vision. Here's just a comparison of the fourth RAW file and the final processed image I had envisioned on the field. If you have been shooting landscapes for a while, you might have encountered certain type of scenes where the light is such that you either clip the shadows or the highlights or you clip both at the same time. These scenes are called high dynamic range scenes and it happens whenever there’s a big light disparity in the picture that your camera sensor cannot handle. The most common case of light disparity in landscape photography is that the sky is usually brighter than the foreground; therefore, you either under-expose your foreground or over-expose your sky. Here below there’s a very simple example. In the first RAW file, the foreground is properly exposed as you can see from the histogram, but the sunset sky is completely clipped and I lost almost all the details. In the second frame, instead, the sky has retained all those beautiful details since it’s properly exposed, but the foreground is far too dark and from the histogram we can see that the shadows are a little bit clipped. How can we fix this? Well, there are a couple of ways to fix this problem, but I will only mention them here and then explain them in other posts; otherwise this article would resemble the Divine Comedy by Dante Alighieri (yup…it would be super long). The most common method to resolve high dynamic range scenes is to use graduated neutral density filters to selectively darken the sky. 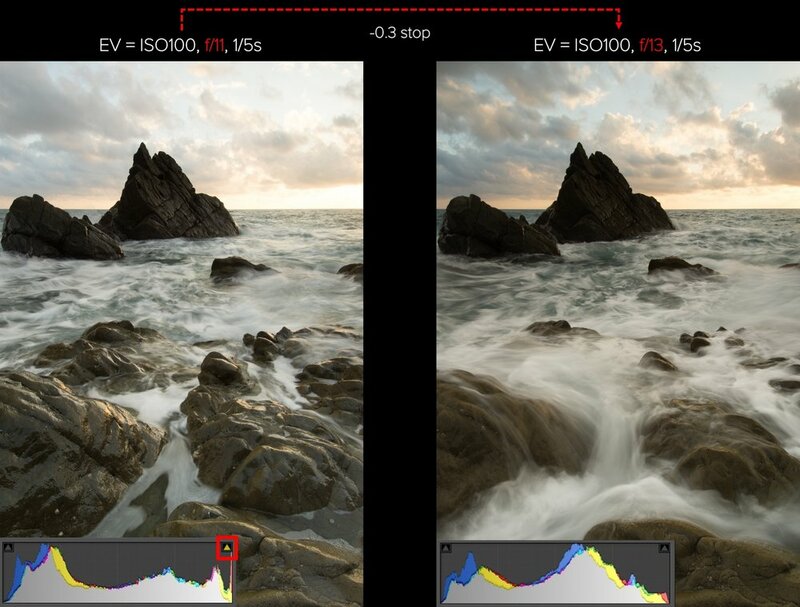 The other method is to use bracketing and exposure blending in Lightroom or Photoshop. I promise I’ll get to these topics later on. 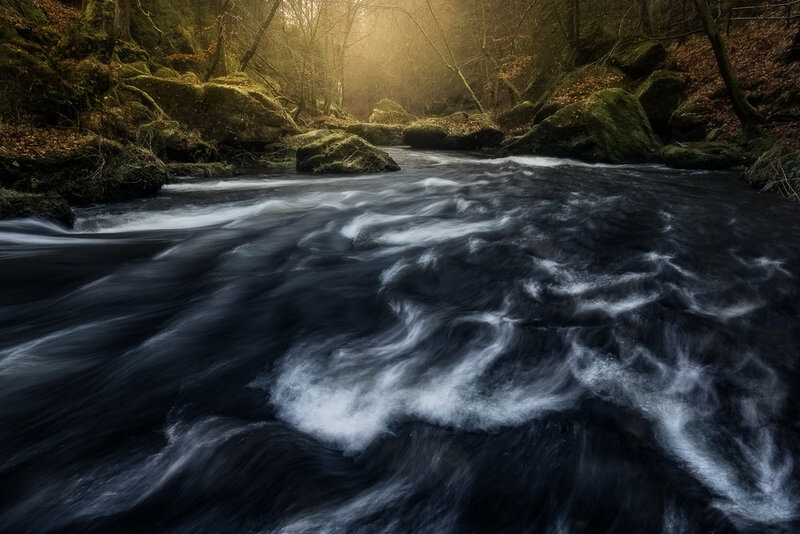 Just remember that it’s not that uncommon to find high dynamic range scenes in landscape photography and usually the use of filters and/or bracketing will help you to achieve that perfect exposure where both highlights and shadows are not clipped. It has to be said that a tiny amount of clipping can be also corrected during post-processing, where you can "recover" part of the clipped shadows or highlights. For example, I might be able to recover part of the shadows to the second RAW file as not a lot of pixels are actually touching the left-hand side of the graph; hence, clipping isn't that bad. The take home message here is: try to avoid clipping as much as you can, but don't make it an unbreakable dogma. I hope this post helped you understand the usefulness of the histogram to achieve well-exposed images. It’s important that you become familiar with the histogram as well as with the exposure triangle to make quick decisions when on the field without thinking too much. This will allow you to spend more time thinking about composition and to be more creative with your shots. I am sure all these information will become second nature very soon if you practice them consistently.